The costumes in The Great Wall are, like, really beautiful. Think ancient Chinese Power Rangers. Plus, some of the action is innovative and exciting. Beyond that, though, there really isn’t much positive to say about Matt Damon’s very, very bad bilingual monster movie. 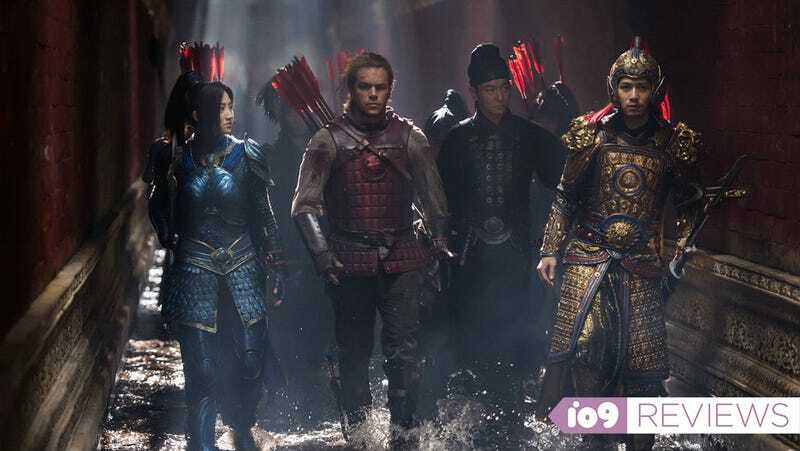 Directed by Yimou Zhang, The Great Wall stars Matt Damon as a mercenary we know very little about and learn virtually nothing else about over the course of its run time. (IMDb names him as “William” but I don’t remember that anyone calling him by name in the movie much.) We know he and a friend (Pedro Pascal, whose character apparently also has a name, according to IMDb) are on a selfish quest from the West and get captured by the Nameless Order, a mysterious army stationed on the Great Wall of China to protect the country from the Tao Tei, a huge army of flesh-eating, unstoppable green lizards. That premise feels ripe for a bit of fun and the film teases that for a few minutes, as some vague history is given about the Tao Tei and we’re introduced to several leaders of the Order. Very quickly, though, we realize all of that is basically just a window dressing to sustain the film’s large-scale action sequences. This could have been fine... if these scenes were done right. But the battles are just CG nonsense. Bad CG nonsense. Besides being Lord of the Rings on a budget, what’s on-screen still feels very random. Attacks come at any time, with no rhyme or reason. The rules to what the enemy can or can’t do vary from scene to scene. Most of the humans are merely set decoration. “Character development” is restricted to a few lines of awful dialogue. There are definitely a few “wow” moments using the Great Wall itself, but ultimately, you don’t care about any of it. Meanwhile, the script, credited to three writers and three people on “story”(?) is laughable. It apparently took six people to make the skeleton of a plot devoid of character development. All of the dialogue sounds like someone wrote a line, took out a thesaurus, and then found the simplest synonym for every word used. It’s really poorly written, and you will find yourself laughing at the non-stop barrage of bad lines. It doesn’t help that Damon himself delivers these lines with almost zero energy. Watching the movie, you almost can’t believe he’s in it—even while you’re watching him, he feels completely absent the entire time. Some of that could be credited to the fact “William” is supposed to be a sort of fish out of water, but we’ve seen Damon make that believable in a lot of incredible performances. This isn’t that. It’s maybe his worst performance yet. He’s partially saved by the largely Asian cast who exude presence and charisma, although most of them are given very little to do. The standout among them is Tian Jing (above), who plays Commander Lin. She has the fullest role and best performance in the movie, and despite her terrible dialogue, you can feel the weight of the situation in the character. It’s something that can’t be said for the other leads, or any of the other characters who add little to the plot. That especially includes “William” who’s always a step behind the Nameless Order, following their plans and using their technology. If you took him out of the movie entirely and reshuffled a few things, it wouldn’t have lost anything. The character ultimately adds very little in terms of forwarding the plot or themes, as thin as they may be. But the most damning that of all? The movie somehow doesn’t even get the Great Wall of China right. Yes, it provides for a few cool moments, but the Wall never feels like the historical stronghold it’s supposed to be. Then, with relative ease, it becomes an afterthought by act three. If a movie called The Great Wall can’t make the Great Wall feel “Great” then what can it do? Not much. Add that to the bad acting, the bad characters, the bad dialogue, the bad everything, and there’s nothing great about The Great Wall. Honestly? There’s not even anything good. Well, except the costumes.